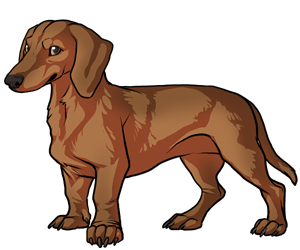 Although rumored to have origins as far back as the Egyptians, the Dachshund is known to have been bred in Germany in the early 1600s. The breed was developed from several German, French, and English terriers and hounds to create a fearless, short-legged hunting dog that could pursue game into burrows. The breed was recognized by the AKC in 1885 and became one of the most popular breeds in America by 2008 where it ranked number 7. Today the breed is a popular pet among many different kinds of families including those with children and elderly people. The name "Dachshund" literally translates to "badger dog" in German. The breed was named after their ability to track and fight badgers to the death. The Dachshund has been used as a symbol for Germany including a picture used for the 1972 Summer Olympic Games in Munich. The characteristic long ears and curled tail of the Dachshund were bred intentionally into the dog to prevent anything from getting into the dog's ears when burrowing and the tail served as a tool to haul the dogs out of a burrow if they got stuck.